ENTRIES CLOSED on 28/10/2012 midnight AEST. The WINNER of this Giveaway is Kelly Evans of Qld. Congratulations Kelly and thanks to everyone for entering the giveaway. I have had offers to review some food products in the last few weeks and I wanted to tell you about some of products I liked and would use again. And lucky for you I have some products to give away for one lucky person to try as well. Like everyone else, I am a lot more conscious of the type of food I am eating and giving my family these days. However, that said, I am still always on the lookout for healthier treats that we can all share and enjoy. It is about moderation, not abstinence. Well that is what my grandmother lived by and given she lived until she was 97, who am I to argue. These are the best thing I have ever tasted in my life. Better than chocolate. Seriously. And just to be upfront about this. No, no-one is paying me to say that. They are little triangles of absolute coconut goodness. The perfect Summer staple. And the best thing is they are just made of fruit and coconut. Simple. In fact they tasted so good, that I asked my sister in a law, who is a dietician, to check the ingredients for me. She gave them the nod of approval. Like anything, too much of a good thing can be bad so possibly eating the whole box in one sitting, while quite understandable, is not desirable. The Smoozes come in four flavours - Mango and Coconut, Pink Guava and Coconut, Pineapple and Coconut and Simply Coconut. they are 100% natural and have no additives. That is music to every mother's ears. Four of these precious items will make it into the Giveaway Pack (if my fingers can be pried away from them). You can find these products at all supermarkets, health food stores etc and the important thing to know is that when you go into the supermarket they come looking like this - in boxes of 10. You won't find them in the frozen section but near the jellies, ice cream cones and toppings. And I am just warning you Melbourne shoppers - YOU BETTER LEAVE SOME ON THE SHELVES FOR ME. 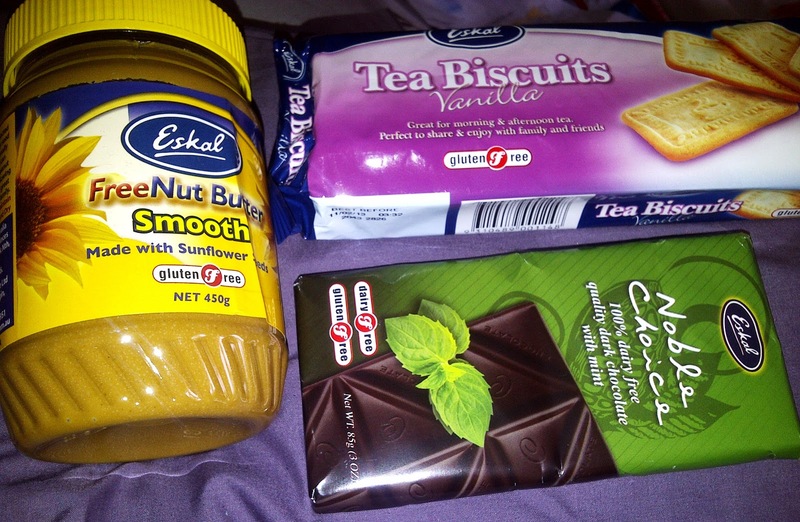 I was given three Eskal products to try. Gluten free vanilla tea biscuits, Nut free Butter and 100% dairy and gluten free dark chocolate with mint. I really like this brand and have tried some of their other gluten free products such as the Deli Crackers and their wafers. Eskal has a good range of gluten free products to choose from at the Supermarket. The products I have tried are tasty and are permanently on my shopping list so I was keen to try these new products. The Free Nut Butter is surprisingly good. It is made with roasted Sunflower seeds and a great peanut butter replacement. Perfect for the morning's toast. I tested the tea biscuits over a cup of tea with my sister. They are vanilla flavoured and quite tasty, unlike most of the cardboard tasting gluten free biscuits I have tried before. I tend to stay away from biscuits when I can but these are small and perfect to have with a cup tea or coffee or to hide in your cupboard when your gluten free guests come over. And that list is growing daily. I was champing at the bit to try the chocolate. I am not a fan of dark chocolate (I know..I know...) but I gave it my taste test. This chocolate was really quite creamy and I loved the mint flavour. I saved some for a few friends who are dairy intolerant and they really like it too. While chocolate is one of those things I could eat all day I would buy this every now and then as a treat to share. You can find more about all the other Eskal products at their website. They have been manufacturing food for a long time and I really am a fan of their gluten free range. THREE Eskal products will also go into the Giveaway pack for one lucky reader to try. 3. Well Naturally - No added sugar Milk Chocolate. I was sent four different chocolate bars to trial. I know, the things I have to do just so I can let you know if it is good or not. And as everyone knows you can never have too much of a good thing right? My friend actually lost 20k and ate one of this brands dark chocolate bars every day. This brand has a lot of health products on the market which many of you would have seen and possibly tried before. I have tried their high protein mini bars as quick pick me ups after my 10k runs (oh ok then....just because I wanted a treat). I am a little cautious about no added sugar products because of the sugar replacements used. However, in this case stevia is used as a natural sugar replacement. The stevia plant has a long history of use as a sweetener in South America. I actually use Stevia from time to time in baking so I am comfortable with that and know the benefits. The choclate which comes in different flavours is truly delicious, especially the fruit and nut. You can find out more about the products here. There are SIX chocolate bars going into the giveaway for one lucky reader. The WOW stands for wonderland of wellbeing. I was sent four packets of Sugar free sweets to try with family and friends. Chewy Fruits, Buttered Candy, Fruit Candy and Eucalyptus Drops. There are 9 different flavours in the whole range. Chewy Fruits are my hands down favourites, maybe because I have tried these ones before, a lot if truth be told. You can buy these from supermarkets and various pharmacies around Australia. This company is Australian owned and the products are also made here. The sweets are 99% fat free, cholesteral free and they have no artifical flavours. They are really tasty and I think they are great if you are looking for something sweet evey now and then. The only thing to be very mindful about is that you should never have too much of these sweets all in the one sitting. Simply because the sugar substitute used can cause a laxative effect (well unless you are looking for that particular outcome of course). Moderation is a good thing. There are FOUR packets of confectionary to add to the Giveaway Pack for one lucky reader. Leave me a comment and tell me what you do to stay healthy (even if you have to tell me you put lettuce leaves on your vanilla slice, I understand unusual food combinations). Disclaimer: Please note that I received samples of the above products to trial and my scales indicate that yes, I did indeed eat them all. And NO I am not showing you the proof. The things I do for people of the Internet. No money exchanged hands unfortunately but chocolate, and now Smoozes, beat money hands down anyway. The comments expressed in this post are purely my own, clearly. PICK ME, I would love to try Smooze. My health tip is - close your eyes before you eat anything bad. Works wonders when you jump on the scale too. Some Aussie reader is going to be mighty happy. :-) Unfortunately, I have found that when it says "No sugar" it's got some other sweetener that is probably not too good for me either. Sigh. I have to watch my glucose. It's a hard life. Sheesh! I am interested in the sugar free alternatives and the choc looks good. My tip? don't eat carbs after 4pm. It works. Smooze sounds interesting...I did like the Well Naturally bars. Would love to try their dark chocolate though. My health tip after losing 3 kgs in 7 weeks: follow a healthy diet and exercise. Currently my diet is about having 1200 cals a day and I found out that once I reach my goal weight and want to maintain it, I can have 1300 cals. I haven't had to give up anything completely but definitely cut down amounts of what I was eating. I have managed to cut sugar out of my diet for 6 days a week, this includes illiminating my Simple Carbohydrate intake. My one day of sugar is not Crazy Binge but I allow myself a Free day!I have lost 58kg to date, and I am feeling really good. Wow what an inspiration you are Kelly. Congratulations, that is fantastic! I troll the supermarket aisles but look not buy! I don't take into my house anything that is going to be 'sinful' to eat because I have no self control. If it si there I will eat it. I put peas with everything we eat for tea, they make everything seem healhier, there's nothing wrong with having shop brought chicken nuggets on a busy night, as long as you serve peas with them I reakon!! I am always looking for a healthy snack that is a little bit naughty. I like the idea of one cheat day a week though.Everyone I know seems to be on a gluten free diet - it must be hard for restaurants and places to cater for everyone these days. I like the sound of all this stuff really. The idea of that sunflower seed butter is intriguing too. I drink loads of water.... go to the loo all too often, but staying hydrated keeps me healthy... and full, so I don't feel the sugary urges! Good idea Monika. I try drinking water but you have to keep it up. I have a vegetable juice everyday, somehow it stops me craving carbs so I eat better! Free Nut Butter is sooooooo good. After years without peanut butter due to my daughters allergies I was over the moon to discover free nut butter. I'm eating a high protein, low fat and sugar diet and I walk every day. I make my own bread at home and try to avoid additives where possible for the kids especially. We are a Gluten Free family, for the most part, because of our daughter. So any Gluten Free product that is tasty gets my tick of approval. As for staying healthy, I try to reach for a piece of fruit rather than a biscuit. Of course, if the piece of fruit is an entire watermelon, I'm kind of defeating the purpose. Oh Mary that is where I have been going wrong. Well I try to make sure there is either vegies or salad on our plate everynight as part of the meal. Unless its pizza then I have no chance. I try not to eat sugar but sometimes I swear it calls me to come into the kitchen. So mean. We always keep a good supply of fresh fruit in the fridge to add to yoghurt/salads and always have frozen berries in the freezer, such a nice little snack when the Queensland sun is out! These sound intersting ,love the sound of those cocnut ices, yum. I always have sald or veges with every meal (other than breakfast). This looks great, and as a gluten free family I would be very interested in the Eskal Products. Especially the mint dark chocolate. I like the look of those Smoozes, are they available just at the major supermarkets do you know? I love hearing about other products out there. My biggest health tip is to start your own vegetable garden. We have saved so much money this year doing that. Its been great for all the family too. My whole family eats gluten free so I would be interested in trying these products.Thanks. 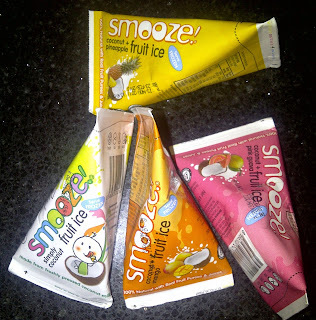 I have tried the Smoozes and they are definitely yum, would like to give the others a go too. I smuggle extra veges into their meals and ensure that snacktime is fruit or veges and treats are only occasionally. I make sure that we celebrate the special days with treats such as birthdays, christmas etc etc. Other times we live clean, with healthy foods and a lot of homegrown veges too. It is really hard the older your kids get because they are influenced by their friends but you can only try your best. I have absolutely no healthy tips thats why I desperately need to try these products. No, I am not joking. I eat what I like and walk everywhere. If I to decided between a healthy option and a high fat option I will go for the healthy one 80% of the time. I try and eat low sugar and low fat as much as we can. I don't deprive myself of treats, but if I feel like one decide what it is then do something else for 20 minutes. If I really want it I can have it more often than not I've forgotten all about it! There are always veges in lunch and dinner - vege colour makes dinner look and taste great! To keep this family healthy we have a large box of organic fruit and vegetables delivered every week. This ensures we are filling our bodies with the best stuff and getting lots of variety, some of the items I would never have chosen or seen before. We then enjoy planning and making meals using these items. My other tip to being healthy is going outside and playing with my children, you sure get a good cardio work out jumping on the trampoline! My tip for staying healthy is not to buy all my favourites in the shopping. I just eat it all! I can't help myself, I love ice cream and chocolate. If its in the pantry, I will demolish the lot! So best I skip those isles at the supermarket . I train 28 hours a week for Roller Derby! I sit in our tree house and watch the sunrise every morning. It relaxes me and recharges my batteries for the day. It is great for my mental health. Some days I get a whole three minutes to myself. I eat a green apple everyday sometimes two! Granny Smith Apples are my lifeline,they keep me healthy & living. I'd just stop without them. I have cut out sugar in my daily coffee's and use lite soy milk as an alternative. I went to buy some Smoozes after reading this. My family love them too. My only suggestion is that there needs to be more advertising as they are so hard to find in the supermarket as they are on the bottom shelves near the jellies. Also these are way more healthy than jellies etc. Thanks for telling us about them and the rest of these products. I read all the labels and by the time I have read some of the horrendous listed ingredients, my enthusiasm for the item has usually waned! 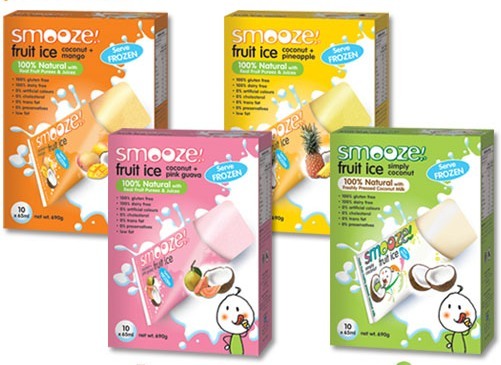 I LOVE frozen mango so will have to try the Smooze Fruit Ices! I eat lots of fruit and vegetables (organic wherever possible) and cook tasty low-gluten, low-fat, low-sugar meals. I grow some vegetables and love spending snatched moments of time in the garden. I take a daily walk with my husband, even if its raining or cold. It clears the mind and is good for the soul. I have started swimming 4-6 times a week, slowly ever-so-slowly building up the laps. I've spent so much time following silly diets that I've forgotten what good nutrition is. The last 2 months, I've been eating clean and tracking calories - just to educate myself! :) Its working!! To stay healthy, all the usual boring stuff, good quality clean food, lots of water, moderation. I'd love to say chocolate coated carrot sticks, but I don't think they would taste that great!!! I keep a big container of carrot sticks, celery and any other likely suspect in the fridge. That way when I go 'hunting' i'm more likely to eat them than something else. such fruit pack gives attractive looks to fruit juice products!! Those look amazing and they're healthy too... WOW!! 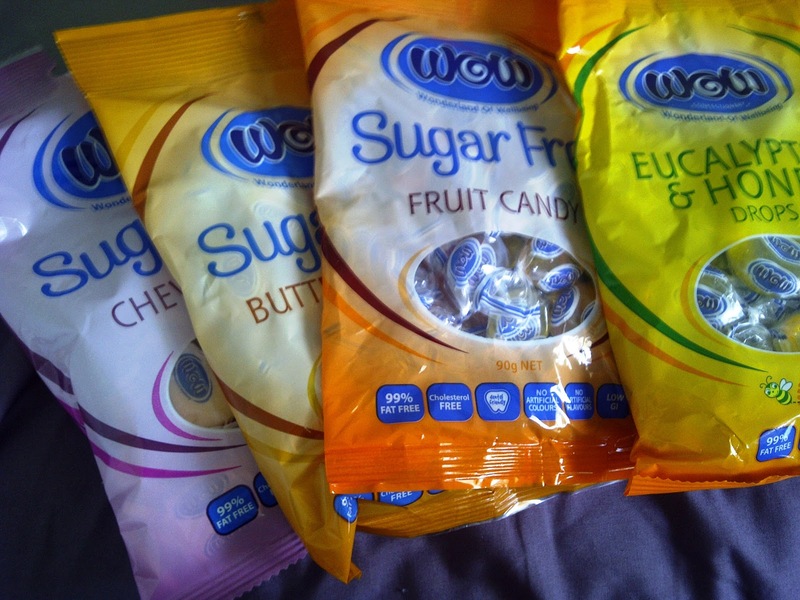 Wow's semi-medicated confectionery (i.e: Eucalyptus Drops and Eucalyptus and Honey Drops) do in fact contain sugar. The rest of their range is sugar free.